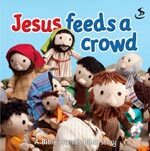 The story of the feeding of the 5,000, told especially for very young children, in a popular board book format. This book features full-colour photographic spreads of the much-loved Bible Friends characters. The board book format is durable and perfectly sized for small hands, with short text for a parent or carer to read to the child.